That power vacuum is likely to complicate the already challenging prospects for deal-making and bipartisan compromise when the 116th Congress convenes in January, regardless of which political party wins control of the chamber. 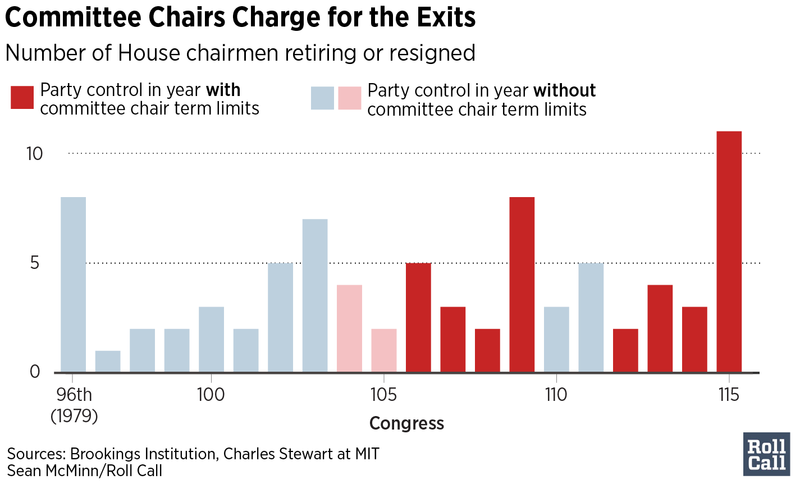 The wave of retirements is sparking a renewed debate about whether House GOP term limits imposed on committee chairmen are worth it and whether the concentrated power in leadership offices, at the expense of committees, should continue. “It hurts the institution to lose collectively so much wisdom about the process and wisdom about relationships that have been built up over the years,” said James Thurber, founder of the Center for Congressional and Presidential Studies at American University. Remaining and new members of Congress, their aides and outside influences, including lobbyists and think tank experts, will step in to fill the void, Thurber said. Though personal factors influence whether a committee chairman, or anyone for that matter, chooses to move on, Thurber and others who study Congress say the string of planned departures is not a random coincidence. Most would have to hand in their current gavels anyway because House Republicans, unlike Democrats, limit their chairmen to three terms, or six years. That’s the case for Jeb Hensarling of Texas at Financial Services; Ed Royce of California at Foreign Affairs; Robert W. Goodlatte of Virginia at Judiciary; Lamar Smith of Texas at Science, Space and Technology; and Bill Shuster of Pennsylvania at Transportation and Infrastructure. By contrast, Rodney Frelinghuysen, the New Jersey Republican who leads the once-prized House Appropriations Committee, is in his first term as chairman. “I have worked in a bipartisan manner, not just in times of crisis but always, because I believe it best serves my constituents, my state and our country,” the Appropriations chairman said in announcing his decision not to seek re-election. Though he didn’t offer an explicit reason for leaving Congress, Frelinghuysen faced perilous re-election odds — and hinted, perhaps, at the partisanship that has gripped Capitol Hill. Many historians and congressional observers trace the consolidation of influence in leadership offices to the speakership of Newt Gingrich, the Georgia Republican who led his party to power in the chamber in the 1994 elections. No matter which speaker sparked it, committees do have less control now when it comes to crafting legislation, and the tax overhaul offers an obvious example. The tax-writing panels, House Ways and Means and Senate Finance, helped fill in the details, but leadership and the White House drove the process. “In terms of actually having committees be a locus of legislative work that eventually comes to the floor, there’s less of that,” Reynolds said. Still, heading a panel comes with the perks of controlling the committee’s staff and resources and having a bigger footprint on policy than a rank-and-file member of Congress. The House Appropriations panel, for example, had an annual budget of about $22.3 million in fiscal 2017, according to House disbursement records, with the chairman technically controlling the entire budget but by precedent giving one-third to the minority for its use. And that’s where giving up the gavels, because of term limits, may factor in for some Republican chairmen. “Since my term as chairman of the House Financial Services Committee comes to an end next year, the time seems right for my departure,” Hensarling said of his decision, while also citing family reasons. 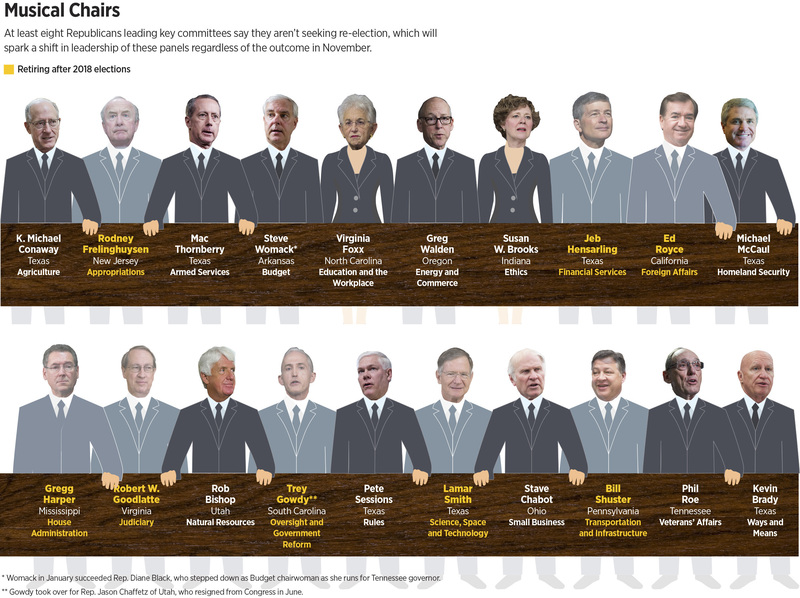 Some Washington insiders say the price of term limits on chairmen may be too high. That doesn’t bode well for consensus in the coming Congress, whether it’s on infrastructure funding or other matters. Congressional committees were created to bring specialization, oversight and policy depth to the legislative process, said lobbyist Jim Dyer, a former House Appropriations staff director. Given all that, the looming round of retiring House chairmen could further stifle legislation coming out of the chamber in the final two years of President Donald Trump’s term — even if Republicans manage to hold on to the House. Committee term limits haven’t worked, said Dyer, a Republican. “It’s been a mistake and has tossed a lot of good people out in the streets. The Democrats are much smarter. They haven’t gotten themselves into that fix,” he said. But some Democrats and many in the GOP, even those concerned about the scale of coming retirements this year, say limiting House committee chairmen to three terms is worth the loss of experience because it provides a relative newcomer to Congress a realistic shot at rising to the top of a panel before they hit Medicare age. The competition among Republicans to stand out on their respective committees produces more policy and political powerhouses, said Jeff Berkowitz, a former RNC official who runs Delve, a political intelligence firm. “It means we’re getting fresh blood and new folks coming in, and we’re making sure folks are building a serious bench,” he said. In contrast, committee and party leaders on the Democratic side have mostly spent decades in the chamber. The Democrats “have folks that could be powerhouses, but they have no hopes of taking on that gerontocracy,” Berkowitz said. The idea of a new generation of leadership was at the center of a challenge to House Minority Leader Nancy Pelosi of California last year, when Tim Ryan of Ohio launched an unsuccessful bid for her leadership spot in the current Congress. Pelosi will turn 78 in late March, while Ryan is 44. Former Rep. Zach Wamp, an eight-term Republican from Tennessee, views term limits on chairmen as a way to offer the next generation an opening. Wamp was elected as part of the Gingrich revolution in 1994, the same year that Democrat Mike Doyle of Pennsylvania won his current seat in Congress. Doyle, who is 64, said he made a forceful pitch to his caucus, when Democrats were in the majority, to institute term limits for their chairmen, to no avail. He also doesn’t believe that term limits force all former chairmen out of Congress. For example, the former Energy and Commerce Chairman Fred Upton, a Michigan Republican, remains on the panel after wielding the gavel. Wamp, who has joined an effort calling for an overhaul of campaign finance regulations, said a lesser-known reason that committees have lost some of their luster is the hefty political dues those spots require, if unofficially, of potential chairmen. Colorado Republican Ken Buck, in his “Drain the Swamp” book published last year, writes that chairmen of the prime committees are expected to raise a whopping $1.2 million in a two-year election cycle. The retirements of committee chairmen offer fresh evidence that the pressures to raise increasing sums of political money to hold these gavels may be too high a price for some lawmakers, Wamp said. Though some of the term-limited chairmen could theoretically take on a new top slot on a different panel, most do not seek multiple gavels. Some simply don’t have the policy expertise to take over a different panel, but others tire of the expectation to raise and dole out campaign cash to their party’s coffers. Of course, lawmakers could change it. At least, their leadership could.